A fascinating study out today compares the dinner time habits of American and Italian families and finds that a lot depends on what “dinner at home” actually means. 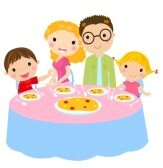 Is everybody at the table or are one or more of the kids lounging on the couch watching TV and eating dinner there? Is everyone eating the same meal? This leads to an interesting discovery about grocery shopping. American homes, equipped with bigger (and sometimes multiple ) refrigerators are loaded with packaged food which often come in single serve packages. So a family can sit around the table, each with their own choice of microwaved meal; while Italians who, with smaller refrigerators will shop more frequently , prepare one meal to be shared by the family. It has been argued that the American dinner experience is a consequence of the pace of life. Packaged dinners are more convenient to prepare because they take less time. The study finds, however, that they reduce preparation time by only 10-12 minutes. Although I am no fan of packaged dinners (I was conferred the title of “meanest Mom ever” for refusing to buy something called “Kids Cuisine” from the freezer section, apparently all the rage in the kindergarten demographic), I have to add that this does not seem to take into account the cleaning time involved with preparing meals from scratch which would involve even more time in the kitchen. But the real surprise here was that only 22% of dinners are actually prepared from fresh or raw ingredients without any processed or packaged ingredients. I can understand using frozen or canned vegetables, or a base for sauces but seriously, how hard is it to use all of this to prepare a pasta dish while the chicken gets done in the oven? How can we do this better? Perhaps we could follow the rule that eating is an activity for a certain time and place, that means an end to never ending single serve snacks that ruin dinner, and it also means eating at the table with everyone or not at all. Everybody helps to prepare dinner, if the adult cuts the vegetables the older kids get to clean them, early graders can lay and clear the table, and everyone tries to appreciate and value the effort put in by the cook. It’s not that hard at all, we should give it a try. This entry was posted in Food Choices, Hunger, Living, Nutrition and tagged food decisions, Green, Hunger, nutrition. Bookmark the permalink. No wonder North America has a weight and health crisis! I really like your wordpress design, wherever do you get a hold of it from? Excellent post. I used to be checking constantly this weblog and I’m inspired! Extremely useful information particularly the remaining part 🙂 I maintain such info much. I used to be seeking this particular info for a long time. Thank you and best of luck.